My First Quilt - Fabric, Patterns, and Tools! Thread: My First Quilt - Fabric, Patterns, and Tools! Hello y'all! I am in the process of beginning my first quilt, but I need some suggestions! It has been a long time since I've even used my sewing machine, and I have never done a task this big before. 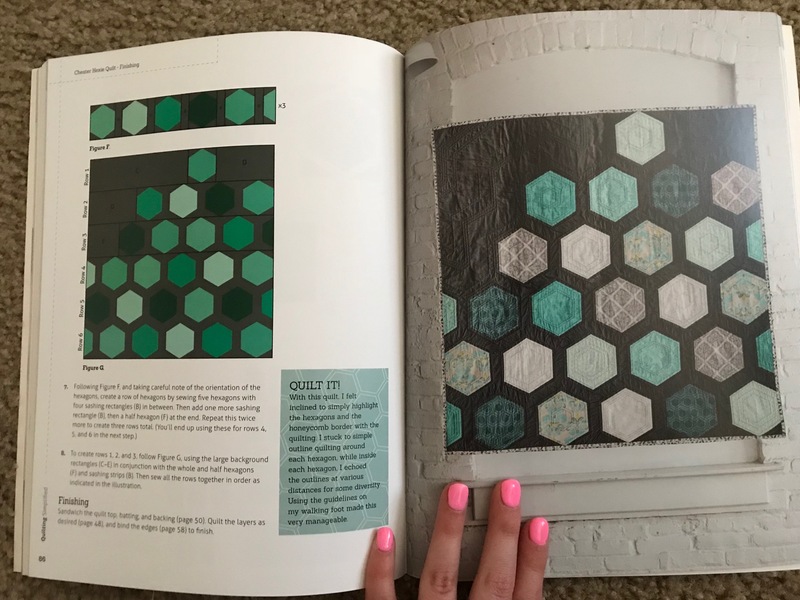 I have a book with patterns and detailed instructions that are really easy to understand. But I am wanting advice on multiple things. 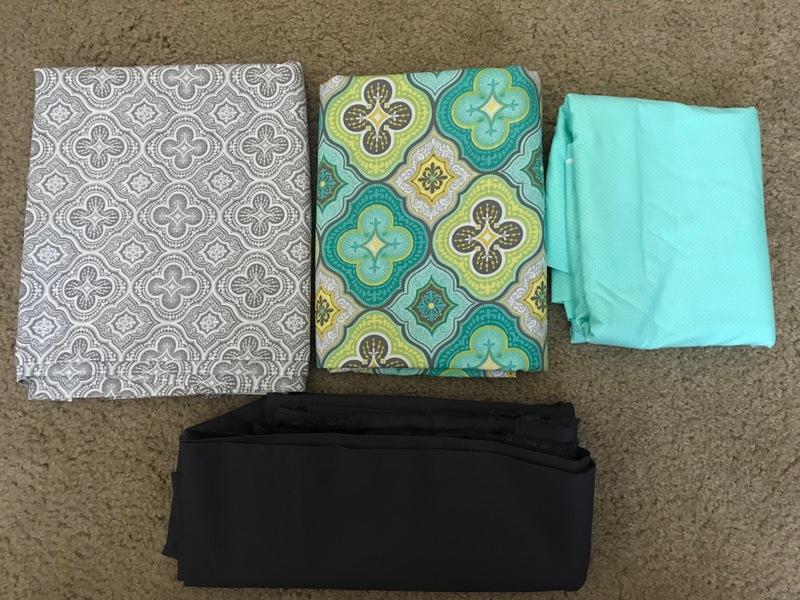 First off, I have some "scrap" fabric that I am going to use to get used to using my machine again, make sure its in perfect working order before I make these quilts. I have read that it is good to pre-wash fabric, especially with cotton. I think it would be a good idea, but I don't want anything to get messed up in the washer/dryer before I even get to use the fabric. When it comes to making your quilt, what is your process? I would assume getting all of your pieces cut first, "mach" assembly to make sure everything look like it will fit correctly and you have enough pieces, and then you start sewing? Do I have to have a fancy sewing machine to do the sewing that keeps the batting in place (I forget the technical term for it, sorry!)? I have read mixed opinions on this. I have a basic Singer sewing machine that was a birthday gift from 10 years ago. She sew's well but doesn't do anything super fancy. I am making these as gifts, and was thinking about doing them either twin or queen size, any opinion on doing a larger size when your just starting? They are going to be Christmas Gifts, so there isn't a huge rush. 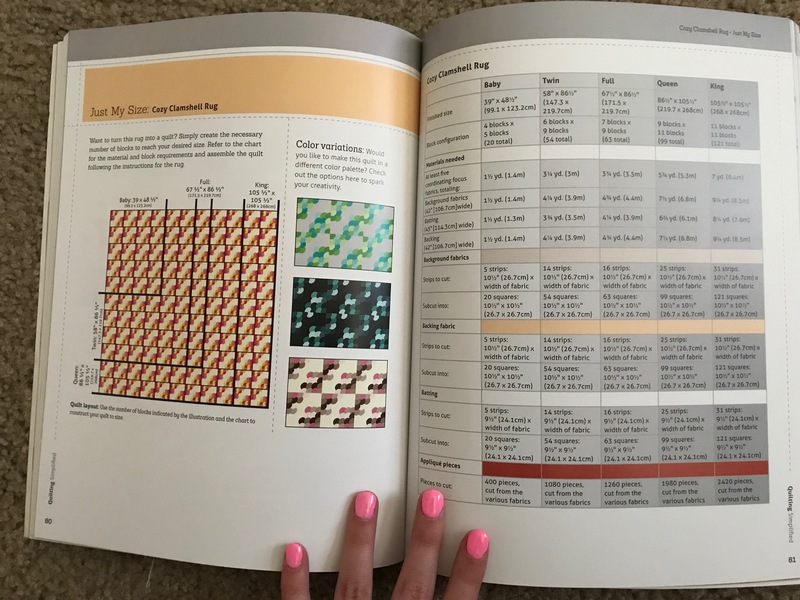 I will upload pictures of the fabrics I have selected, as well as 2 of the patterns I am looking at doing from the book I have. Sounds like you are ready to go. I will look forward to pictures on your progress. Thank you! I sure will! I am very excited! Here are the Fabrics I have selected, and the two patterns that are in the book. The dark grey color in both pictures is what I have for backing and binding. First, I want to welcome you to the wonderful world of quilting. You don't have to pre-wash your fabrics first, it's a matter of personal preference and the look of the finished quilt. You don't need a fancy pants sewing machine, many of us sew on antique/vintage machines. As for your approximate age Singer, that might be a problem, the modern Singers are not the well made machines the old ones were. The top, batting, backing is known as a sandwich, there are various methods of basting the sandwich, pin, thread, spray, glue, which needs to be done, before quilting, you just need to decide which method. How "easy" the actual quilting will be, depends on how big your quilt is, how much throat space your machine has. Starching or using something like Best Press is very helpful, make sure though that you use the starch properly or you'll end up with a mess. Your patterns are very nice but there's no way that I would attempt them as a beginner quilter, but others have started with what I would call "advanced" patterns and done okay. Last edited by pocoellie; 05-14-2018 at 04:56 PM. Thank you Pocoellie! I am curious as to the state of my sewing machine. I recently moved and I haven't gotten it out of the box yet (mostly due to space in our small apartment.) I figured I would spend a day cutting the fabrics and assembling them, and the next day sewing them together, etc etc. Which method of basting the sandwich lasts the longest? I am thinking thread, since it would seem the most durable option? The machine has the "average" space I would say, I know my mom has used it (more than myself since it was my 12 year old Christmas present) and she made quite a few elaborate costumes for my siblings and I on it and it seemed to work well. I may look as see if they make a "table" for the model I have, that would give me some extra room?! I do have another bolt of fabric that I have for my personal use, I want to make a babys blanket out of it, maybe I should start with that one? lol! It is super cute as well, and I have a TON of it, I got it on clearance and it was so cheap I bought the whole bolt! I love your patterns, but I have to agree with Ellie. They are more challenging than I would recommend for a new Quilter. If you have experience in other types of sewing that may make them less of a challenge, but you have to be the judge of that. Making samples out of scraps first is an excellent idea. That should let you know if you want to attempt the whole quilt. If you do the quilts you've picked out, I would recommend a lot of starch, and slow, careful sewing. I normally don't cut everything at once. I cut enough for a sample block or two and finish the cutting if I get those assembled correctly. You definitely want sharp blades for your rotary cutter, sharp machine needles, and sharp pins. Please post pictures of your work. Oh, and welcome to the board! I love the quilt you made Wesing! Its beautiful! Yes, I think I may find a simple pattern and make a baby quilt first, so I can learn the ropes again, Its been a while since I've used the machine! I will have to post a picture of that fabric so y'all can help me pick a cute pattern! My husband is going to think I am crazy for making/saving another Baby item lol! We've been married 6 months (dating for a year and a half before we got married) and I keep having to fight off baby fever lol ! It will be a while before we have kids, so maybe this will help curb it lol! Welcome to the board and quilting! Pretty fabric and the selections blend beautifully...so you've got an eye for color. The patterns you've selected look more advanced than a beginner but go for it. I did the same with my first quilt and learned a lot in the process. When you approach the clamshell quilt pattern, you may want to YouTube some tutorials on curved piecing. 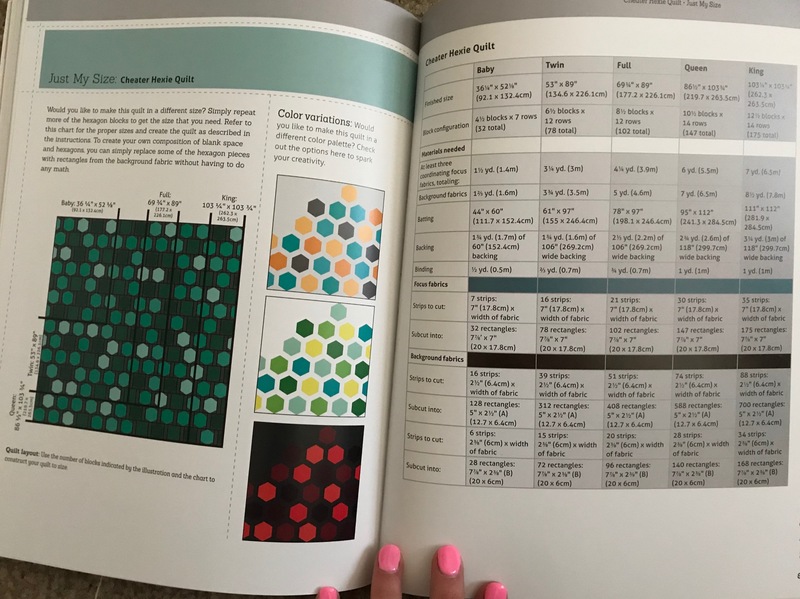 That can be helpful and maybe provide an alternate technique then the book for you to chose what best works for you. 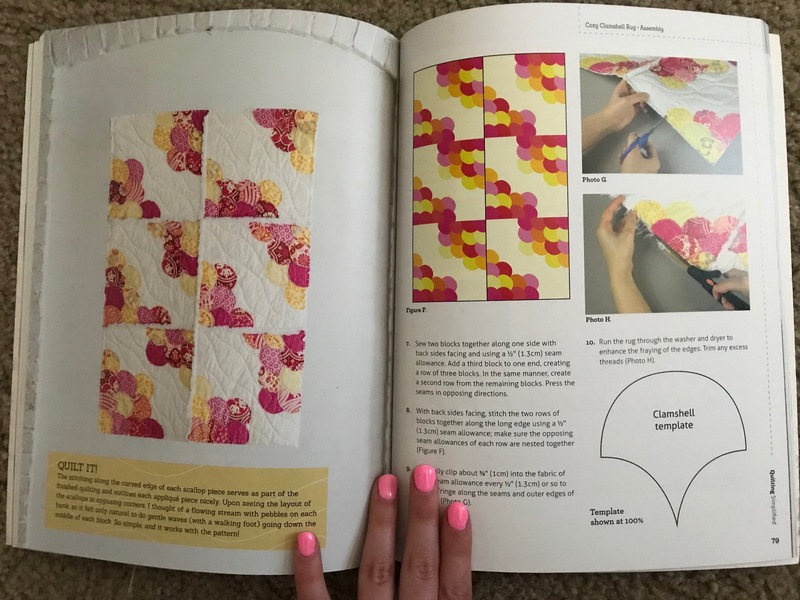 I recommend you attempt to do a block or sample of each quilt pattern using spare fabric just to see if it is what you are able to do easily without getting frustrated. We don't want you to give up and turn away from quilting because you may chose a pattern beyond your ability...you know what I mean? I do not pre-wash my fabric. It is a personal preference. I do, however, wash the completed quilt once before gifting. When you get ready to do that step, come back to the board for suggestions and recommendations. Thank you! I love color, and matching color, contrast, and patterns! I am excited to see how I can bring that to Quilts! I know exactly what you mean Teen! I don't want to get frustrated either! I love the quilts I grew up with, but those are my momma's and I cant steal them lol! I think making a simple pattern baby quilt will be my first move, then I will make the ones for gifts ! I will upload a picture of the fabric so yall can help me find a cute pattern and matching fabric! Oh, I will be on the forum a LOT! I am not afraid to ask questions/for help! Oh...and yes, I would start with a baby quilt or lap size before attempting a bedspread size. Geesh, you are daring, girl! I love it! Here is the fabric that I have for "scrap" and the baby quilt I want to make. My husband is a pilot, and it is so hard to find anything aviation related (that isnt overpriced) and I saw this in the clearance bin at walmart when I was grocery shopping and just bought the whole bundle lol! I am originally from GA, so I am a little southern lol ! Congratulations on starting to quilt. I have been quilting for 15 years. It sounds like you have done your homework and know where to begin. There is a lot of debate about prewashing fabric. While you do not need to do this, some of us do this to remove the chemicals used in the manufacture of the fabric. I have asthma and allergies, so I automatically throw new fabric in the wash. While I love the patterns you are looking at, you may want to try something a tiny bit easier for your first go. Take a look at Missouri Star Quilt Company for tutorials and patterns. Wishing you the best of luck. Thank you Lyricgirl! I actually just saw one of their patterns online, the Orange Peel Pattern, I am looking it up now to see if it is an easier one. It is super pretty!!! You're welcome. They do a lot of tutorials on their site too. Welcome! I'm wishing you much luck and joy with your quilting. You have some good advice here. Your progress may go much more slowly than you anticipate, so be prepared for that. You are getting an early start, though! Thank you DJ! I am getting great advice for sure! I will be going to the fabric store in a few days to get some more fabric for my baby quilt that I will practice with! Sound decision to make baby quilt first. Buying fabric is addicting...so beware. Buying that bolt of fabric will likely give you plenty of fabric to make things for an aviation nursery; however, when buying "bolts" think about future projects. When I buy "bolts", I always consider its use for the backing of future quilts or donation quilts, too. Many of us love hoarding fabric (lol) and still, some of us buy only what is called for in a pattern. Whichever you are, be prepared to give up space in your home. Lots of space.....lol! Hi, Welcome to the board! I am one of the "wash before cutting" people. I have had enough unpleasant surprises with bleeding and/or shrinking to make it worth the effort to me. I also prefer a flatter look. Washing the fabric and batting (if washable before being quilted) is as important to me as using a seatbelt while riding in a car. If you are planning to use clamshells or hexagons, I strongly recommend that you make a practice piece - like a placemat - before you cut up all your fabric. Do you have any small all-over prints or solids to play/practice with? They read as "color" from a distance and do not require fussy cutting. The turquoise fabric is pretty - I made a a couple of totes from scraps from that fabric and it's coordinates - but to me it requires fussy cutting and/or awareness of the pattern. I think it is "tricky" to cut randomly. I love the airplane fabric - but I would try to keep it intact and use it as a backing - and then use the airplane side as the top! As far as sewing machines - for piecing all one needs is a machine that does a decent straight stitch and feeds the fabric evenly and straight. You might try a sample block first before cutting all of your fabrics. That way you can see the color placement in the block. It can help you determine if there are any issues in the pattern directions too. There is time and fabric to make adjustments. For a first quilt look at the double slice layer cake. You don't need a layer cake though since you can cut your fabrics to size. The piecing is straight seam piecing. Plus there are only a few intersections to match. Master the 1/4 inch seam and the cutting processes first. Then proceed to "Y" seams and curves. Yes, it will help my gauge how much time it will take for the larger ones. Plus, I love baby stuff lol, great excuse to look at baby things! 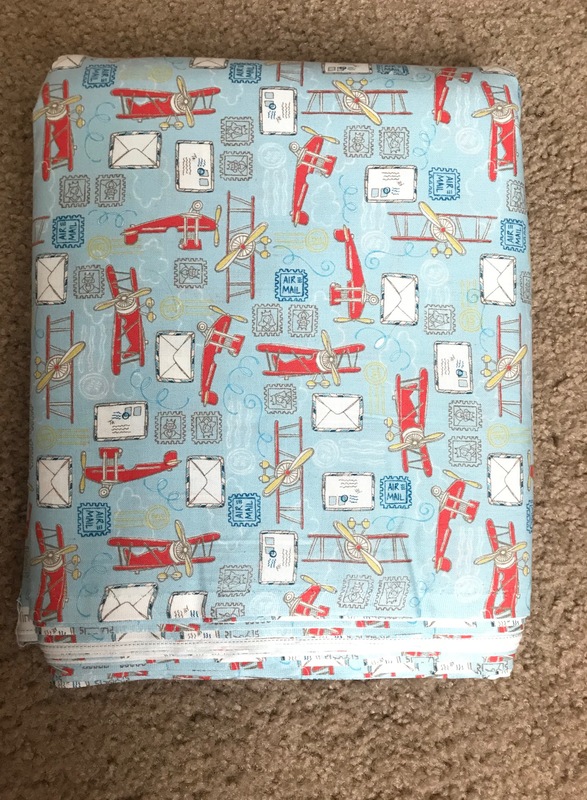 I plain to have a crib blanket with the pattern as well, and then a quilt will be perfect to drape over the edge or have in another room in the house to keep baby warm! If I remember correctly, I have 7 yards, but I could be wrong. Oh no, dont tell that to my husband lol! I already "hang on to things" longer then he thinks I should lol! Thank you so much for all the information! I have a LOT of the airplane fabric, and plan to do one quilt solid of just that fabric, and do just the stitching (no other fabric patches for the front) when I get good at the sandwiching and can do a pretty pattern. I have some darker colors, so I am thinking I will want to wash the dark grey color at least since it is the most likely to bleed. Thank you! 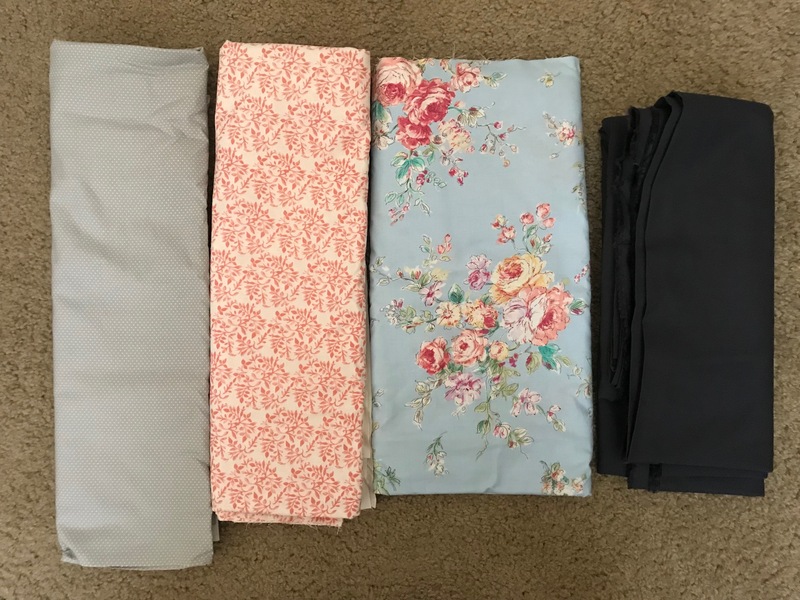 I spent almost 2 hours going through all the fabrics the day I picked these out! It was so fun! Thank you for the Link Rhonda! I will make sure to master my 1/4" seam before I go to the fancy stuff! I feel like I have pretty good hand/eye coordination and sense of design to make it look good but i want to practice lol! Thank you! I starch everything I'm going to work with. I thread baste my sandwiches, I absolutely HATE pin basting, I like spray basting, but don't like the cost, fumes and the mess with the overspray. A table for the machine won't really help with the extra room you need, sewing clothing and such isn't the same as wrestling with a quilt in the same space. Pocoellie- From the videos I watched yesterday (while stitching up a pair of my husbands pants) I saw the lady starch as she ironed, correct? I'll be working off my dining room able (not very big, but the perfect square lol) since we have a tiny apartment, were limited on space and furniture. Oh, that is true, you're right, I was thinking about the wrong side of the machine haha!